Despite evidences that Holm oak has a high plasticity and great adaptability, there is limited or contradictory knowledge of the morphological and physiological variability of this species. Holm oak has been widely used for reforestation projects in Mediterranean areas, but has frequently shown poor field performance. We hypothesized that Holm oak has inter-population differences in physiological responses to abiotic stressors that could affect reforestation success. The influence of nursery culture on the characteristics of Holm oaks from different provenances has not been explored in depth. Thus, we studied the effect of nursery autumn fertilization on morphological traits, frost tolerance, root growth potential, and nutritional status of two Spanish provenances of Holm oak, La Alcarria (a region with inland Mediterranean climate) and Sierra Morena Occidental (a region with a warm coastal Mediterranean climate). There were significant differences between the provenances in frost tolerance, biomass allocation, and leaf nutrient content, suggesting a role of genetic factors. The leaves of seedlings from La Alcarria had less visual damage at −12°C than seedlings from the warmer provenance (45% vs. 92%). Seedlings from La Alcarria, compared to those from Sierra Morena, had higher leaf P concentration (0.17% vs. 0.15%), greater stem diameter (3.1 mm vs. 2.7 mm), lower shoot-to-root dry mass ratio (0.46 vs. 0.53), and lower slenderness (4.03 vs. 5.31). For both provenances, N autumn fertilization improved growth, root growth potential, cold hardiness, and nutritional status of seedlings. 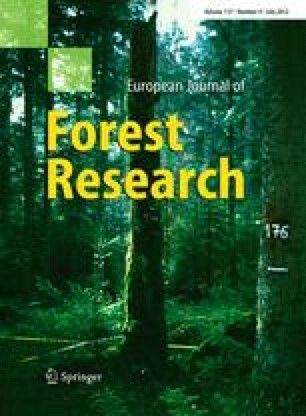 We suggest that forest reforestation programs should consider to a greater extent Holm oak provenances and their tolerances to different abiotic stressors. This work has been financed by MEC of Spain (Ref. AGL2006-12609-C02-01/FOR). In addition, the work was partially supported by University of Huelva and Andalucía Research Programs to promote research groups activity. First author is benefiting from a doctoral grant from the Ministry of Education of Spain. We gratefully acknowledge the support of the laboratory of research and Agrifood control (LICAH) of the University of Huelva for carrying out chemical analysis.